We know that the information is out there… somewhere. We just don’t know where to start looking. With the Web growing exponentially every day, it can be time consuming and frustrating to sift through all of the irrelevant findings. Fortunately, there is away to target exactly what your looking for and all you need is Google! What Is An Advanced Search Operator? Advanced Search Operators are commands combined with specific keyword queries in a search engine that allow the user to narrow their results. How Do You Use An Advanced Search Operator? allinanchor:(search only for pages with this specific anchor text)On this example, we will get super specific…. This is a combination of an Advanced Search Operator (allinanchor:), Boolean Search Operators (AND), ”Houston” (your location), and “opthamologist” (your target client). The Boolean Operator, AND, tells Google to only return results that have all of these keywords on a single webpage. The allinanchor:email only looks for anchor text with the keyword “email” in it. That’s correct. Google only found one result that matched our query exactly. Now, how can we use this for B2B Sales Prospecting? Let’s start by taking a look at some of the search operators we’ve learned already. In this scenario we will use the site: operator. Now, we have to know which site we want to search. Why not start with the largest directory of business professionals on the web? LinkedIn. The last step is knowing who your target client is. It’s not always a good idea to try to specify a person’s title or a position. They vary from company to company and your results could become convoluted with irrelevant information. Instead, your target client is going to be a company in an industry. 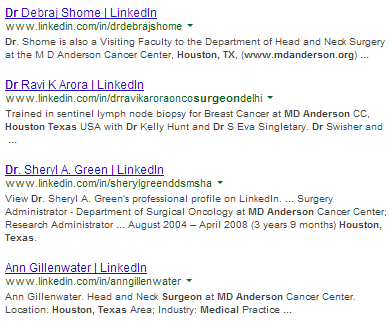 We used site:linkedin.com/in which only allows Google to show results of profiles on LinkedIn. The next step is entering the company website that we’re targeting www.mdanderson.org. Following the website, we use the word ‘Doctor.’ The cool thing about Google is that it uses Latent Semantic Indexing to understand different variations of a keyword such as Doctor (e.g. Doctor or Dr). It’s smart enough to understand that they are the same thing. The last thing we do is use a Boolean Search Operator. This will allow us to require the word “Houston” to be on the page as well which will return us Geo-Targeted results. Interestingly enough, the first three results that show up have ‘Dr’ in the title. The 4th result doesn’t have ‘Dr’ in the title, however, Google used Latent Semantic Indexing (LSI) to relate the word “Doctor” to “Surgeon,” thus providing us with a relevant lead still. You can use other social networks like Google Plus to find local businesses as well using a very similar methodology. If you learn how to use them properly, Google can become your strongest prospecting tool.